Made with anything marvelous from feathers and lace to flowers and sparkle, fascinators have been a part of a woman’s wardrobe since as early as the 18th century! Back then, fashionable woman wore elaborate, beaded, frilly confections (remember Marie Antoinette?) to, well, fascinate! Today, fascinators are a versatile, eye-catching fashion statement for brides. Worn with a birdcage veil, they add a pop of vintage, and paired with traditional veiling, a bridal fascinator elegantly complements a classic look. The feathers that leap to mind when picturing fascinators don’t always have to take center stage. They can be used subtly as an accent, boldly as the entire headpiece, or somewhere in between. 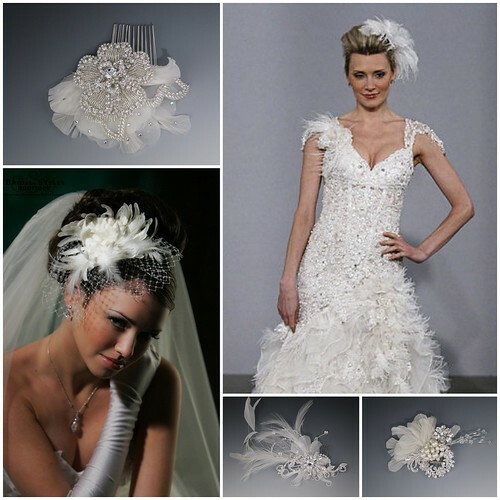 To find a bridal feather fascinator that suits your bridal style, visit us at our New York bridal accessory boutique! This entry was posted on Tuesday, February 1st, 2011 at 11:33 am	and is filed under Bridal Trends. You can follow any responses to this entry through the RSS 2.0 feed. You can skip to the end and leave a response. Pinging is currently not allowed.